A sprint is a short period of time (ideally two to four weeks), during which a development team implements and delivers a discrete product increment. If your Scrum team uses a JIRA Software board as the issue source for a plan, the sprint management feature of JIRA Software lets Portfolio for JIRA automatically detect and pull in the sprints that you create in JIRA Software. Portfolio for JIRA will also suggest that you assign certain issues to certain sprints. If the work doesn't fit into the sprints from JIRA Software, Portfolio for JIRA will generate extra sprints. In the scope table, click the icon > select Teams to make the Teams column display. Expand the details for teams by clicking the Teams column name. This will display two (2) more columns, Members and Sprints. From the sprint column, hover over the issue > click the sprint menu that appears. Select the sprint to which you want to assign the issue. Note that if you assign an epic with child issues to multiple sprints, the child issues will be automatically assigned to the selected sprints. Click Calculate to recalculate your plan. In the timeline of your plan, click the name of the sprint. 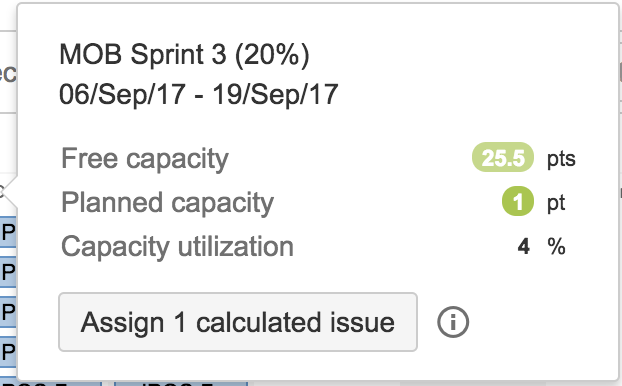 The capacity details and a suggestion for issue assignment for that sprint will be displayed. Click Assign x calculated issues. The issues will be automatically assigned to that sprint.